If you’ve done any research on sod installation, you probably know you have to prepare the soil ahead of time. Getting the ground ready ensures that your turfgrass will take root and grow vigorously, giving you the lush, healthy lawn you want. While proper soil preparation is the key to success, Utah sod suppliers know several tricks of the trade that make laying turfgrass easier. And, to make things even easier, The Dirt Bag can also deliver the landscape materials you’ll need. Before scheduling your turfgrass delivery, take a look at your yard and plan out how you will lay your sod. If you know how you’re going to approach the project, you’ll be able to ask the delivery driver to place the pallets in strategic locations around the site, thereby reducing the time and effort it takes to put the sod into position. To ensure your sod thrives, you’ll need to break up the dirt, remove rock and debris, and add amendments to create a healthy, level base. We recommend adding our Utelite soil conditioner to break down heavy clay and improve drainage. Most of our customers also mix in a healthy dose of organic compost, to provide nutrients to the turf’s root system. Wet the soil thoroughly – but not to the point of pooling – the night before you expect your Utah sod delivery. Once harvested, turfgrass has a short shelf life, so it needs to be installed as soon as it’s delivered. Leaving your sod on pallets all day (or overnight) is a recipe for disaster – especially during the hot summer months. Overheating and dehydration will set in, and the affected turfgrass isn’t likely to survive. If you’re not fully prepared for sod installation, push your delivery out until the next day. Laying turfgrass is a pretty messy job – you really can’t install sod without getting dirty. Wear an old t-shirt and a pair of work jeans or pants, and make sure you have tight-fitting gloves to protect your hands. Plus, since you’ll be out in the sun all day, don’t forget to apply sunscreen. When you lay sod, you can easily see where you need to cut from the top. The problem is, making cuts on the grass side is quite a bit more difficult. For a much easier time, cut from the dirt side – go this route, and you’ll only need a standard utility knife. 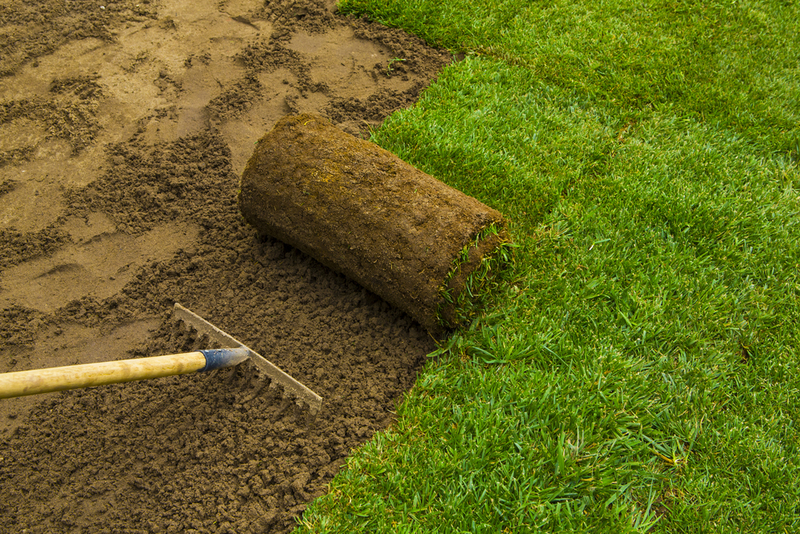 As you install sod, you’ll need to thoroughly water each section. To ensure you’ve watered enough, lift a corner of the turfgrass and stab a screwdriver into the soil. If you find it difficult to push the tool into the earth, keep watering. Be careful not to overwater, however, as the roots will have trouble becoming established if the soil is waterlogged. The Dirt Bag offers high-quality landscape materials, with delivery available throughout Salt Lake County. Contact us today to place your order for bulk or bagged mulch, compost and soil conditioner as well as our lush, green Utah sod.